Welcome to Wisconsin's Most Beautiful Highway! Wisconsin’s Lake Superior Byway follows the southern shoreline of Lake Superior along the Bayfield peninsula and is a snapshot of the geological, historical, cultural, ecological and recreational diversity of the region. The 70 mile route features breathtaking scenic views of forests, pristine sandy beaches, and the sparkling blue waters of Lake Superior and the Apostle Islands National Lakeshore and the Gaylord Nelson Wilderness Area. The Byway is a unique route featuring quaint harbor towns, historic fishing villages and small farms. The beauty of the Byway is experienced through the stories and scenery that embrace the majesty of Lake Superior. 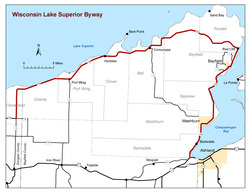 Wisconsin’s Lake Superior Byway (WLSB) begins its journey at the junction of US Highway 2 and State Highway 13 in the Town of Barksdale in Bayfield County, approximately 2 miles west of the Ashland city limits. The Byway continues for 70 miles on State Highway 13 around the Bayfield Peninsula and ends at the intersection of County Highway H and State Highway 13 in the Town of Cloverland in Douglas County. The corridor provides very different geographical and cultural opportunities to travelers as they wind their way North up one side of the peninsula along the Chequamegon Bay around the top of Wisconsin and then West along the South Shore of Lake Superior. 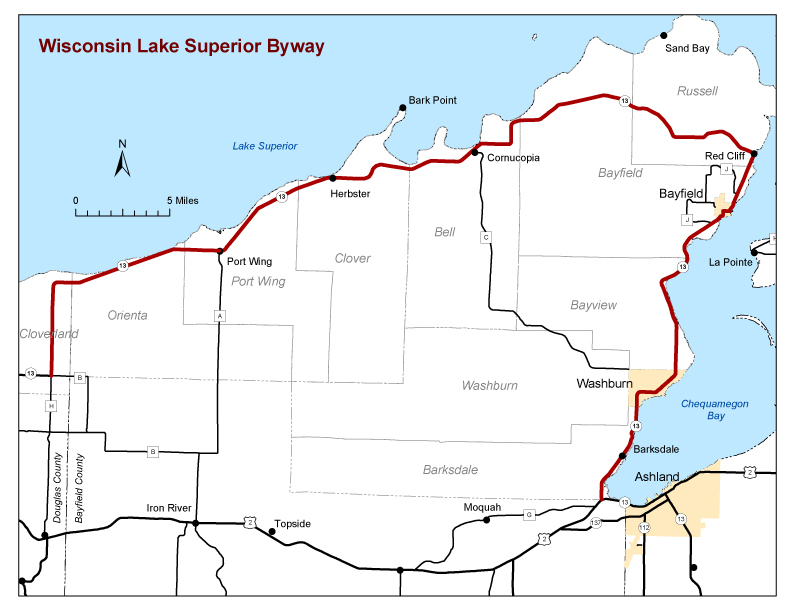 ​Order a map/brochure with lots more information about the Wisconsin Lake Superior Scenic Byway to help plan your trip! You can also view the WLSSB Map & Guide here. Discover Wisconsin Names Byway One of Best Fall Rides! It was a great Apple Fest! Make Your Travel Plans Now to Attend on of the Best Regional Food Festivals in the Nation next year. The New York Times Discovers the Apostle Islands! We're always excited when the international news media "discovers" the Bayfield Peninsula! The New York Times pays a visit, and the writer came to understand the power and beauty of Lake Superior...and the friendly people who make the area so special. We think you'll be equally impressed! 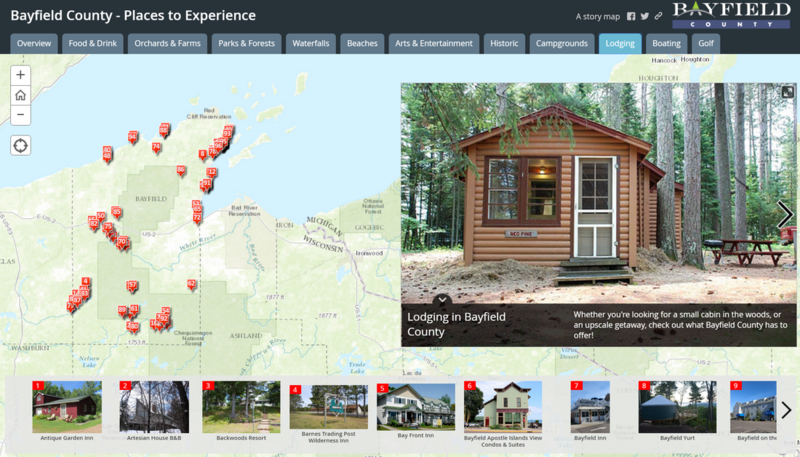 Bayfield County Interactive Map is Now Active...This is So Cool! Find things to do and places to eat and stay on this interactive map of Bayfield County! April 22, 2013 (Washburn, WI) Bayfield County already has an impressive list of state and national designations that exemplify the truly special place that it is. Now added to that list is a 70-mile segment of State Hwy 13 that has been designated a Wisconsin Scenic Byway, the fourth in the state. The Wisconsin Lake Superior Byway is located along the southern shore of Lake Superior. The majesty of Lake Superior unfolds along the Byway with sweeping views of the “big lake.” The Byway follows the shoreline of the Bayfield Peninsula, passing through quaint harbor towns and historic fishing villages, near dozens of orchards and fruit farms, along miles of sand beach and the home of the Red Cliff Band of Lake Superior Chippewa. Densely forested lands provide a spectacular backdrop to the year ‘round recreational opportunities that abound, with hundreds of miles of hiking, biking, snowmobile, ATV and cross-county ski trails. The Apostle Islands National Lakeshore and Gaylord Nelson Wilderness Area is easily accessible from the Byway and has the largest collection of lighthouses in North America. Guided boat excursions are available. Local museums and historic architecture tell the stories of Native Americans and immigrants who made this land their home. Artists are drawn to this area and you’ll find many galleries displaying their work. Enjoy seasonal performances at the Big Top Chautauqua with musicals based on the history of the area as well as performances by national artists or enjoy local theater and regional music all year long at Stagenorth in Washburn and Legendary Waters Resort and Casino in Red Cliff. The rich geological, historical, cultural, ecological and recreational assets of the Wisconsin Lake Superior Byway provide a traveling experience that will not be forgotten. A group consisting of representatives from all of the municipalities along the Byway has put in many hours working on the necessary assessments to obtain the designation, which will bring attention to the incredible natural resources and cultural history of the area. The designation will also allow the adjacent cities and towns access to federal funds designated to help promote the Byway, develop signage, and improve the visitor experience along the route. 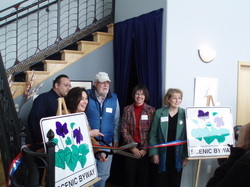 The Wisconsin Scenic Byway program is an official program of the Wisconsin Department of Transportation. Other Scenic Byways in Wisconsin include: The Great River Road, State Hwy 60 and the Door County Coastal Byway.